What do Australians want most from their next government? In this vivid, grounded, surprising essay, Rebecca Huntley listens to the people and hears a call for change. Too often we focus on the angry, reactionary minority. But, Huntley shows, there is also a large progressive centre. For some time, a clear majority have been saying they want action – on climate and energy, on housing and inequality, on corporate donations and the corruption of democracy. Would a Shorten Labor government rise to this challenge? What can be learnt from the failures of past governments? Was marriage equality just the beginning? 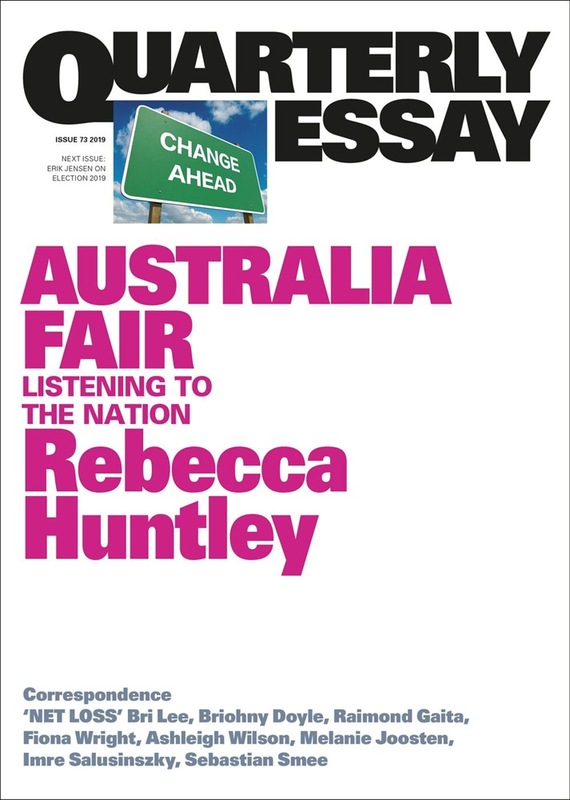 In Australia Fair, Rebecca Huntley reveals the state of the nation and makes the case for democratic renewal – should the next government heed the call. “Often the claim is made that our politics and politicians are poll-driven. This is, on the whole, bunkum. If polls were influential, we would have invested much more in renewable energy, maintained and even increased funding to the ABC, and made child care cheaper. We may already have made changes to negative gearing and moved towards adopting elements of the Uluru Statement from the Heart. We would have taken up the first iteration of the Gonski education reforms. These are some of the issues where a democratic majority comes together, a basic agreement crossing party lines.” —Rebecca Huntley, Australia Fair Rebecca Huntley is one of Australia’s leading social researchers. From 2006 until 2015, she was the director of the Mind & Mood Report, Australia’s longest-running social trends report. She is now head of Vox Populi research. Her most recent book is Still Lucky. She presents The History Listen on ABC Radio National. Acquista Quarterly Essay 73 Australia Fair in Epub: dopo aver letto l’ebook Quarterly Essay 73 Australia Fair di Rebecca Huntley ti invitiamo a lasciarci una Recensione qui sotto: sarà utile agli utenti che non abbiano ancora letto questo libro e che vogliano avere delle opinioni altrui. L’opinione su di un libro è molto soggettiva e per questo leggere eventuali recensioni negative non ci dovrà frenare dall’acquisto, anzi dovrà spingerci ad acquistare il libro in fretta per poter dire la nostra ed eventualmente smentire quanto commentato da altri, contribuendo ad arricchire più possibile i commenti e dare sempre più spunti di confronto al pubblico online.